I was taken back. My usual requests were for ‘something with action adventure’ or maybe something like Wimpy Kid or Maze Runner. This was the first time that I was asked for an emotion and a rather personal one at that. I drew a blank. Usually I can think of something, but heart-wrenching sadness? I consulted the catalog and tried to think of something that would elicit that type of feeling and would still be something we actually had available in our middle school library. I found a few titles and also asked my library assistant, Mrs. Johns, if she could think of anything. I presented our meager findings to the student, but I had the feeling these weren’t what she was seeking. She was asking for something that would deeply and profoundly effect her on a visceral level. Then this weekend, I finished a historical fiction by one of my favorite authors, Christopher Paul Curtis, that fit the bill perfectly. The Madman of Piney Woods is both beautiful and sad. It’s a continuation and companion novel to Elijah of Buxton, but not really a sequel. The setting is 40 years later in the very early 1900's in Canada, specifically the towns of Chatham and Buxton and the surrounding woods. The story revolves around the experiences and friendship of two Canadian boys, Benji, who is descendant of slaves, and Red, who is of Irish ancestry. 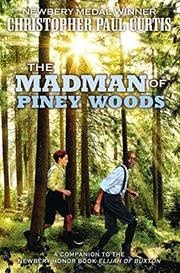 The Madman of Piney Woods by Christopher Paul Curtis is about character and how human beings become who they are. How we react to fear, sadness and pain can either strengthen us and bring out the good in us, or it can destroy us - body and soul. I loved this book and was touched by its beauty and grace. The Madman of Piney Woods evokes empathy from the reader, and teaches lessons about the resilience and beauty of the human spirit, of goodness and kindness. It's about recognizing similarities rather than dwelling on superficial differences. When I see the girl again, I definitely have something sad and yet uplifting that I can recommend. If anyone has any recommendations they'd care to share, please leave them in the comments. I always am looking for recommendations on a good book.